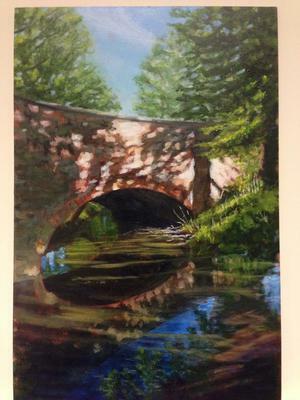 This is a view that I have just painted of the bridge in my village. I've sketched the scene a few times but the painting was actually done from a photo that I found on-line. I think my phone camera has made the colours appear a little brighter than they actually are. For example the foliage reflections in the water are nowhere near as bright and the shallows in the bottom right hand corner are not as visible as they appear. However barring the deficiencies of the photo, what I would appreciate is some good honest feedback - my concern is that the trees don't look too good. What is your impression ... do they look "plastic" to you and if so what could I do to improve it? Comments for Painting Advice Needed Please! Thank you Linda and Jim - your comments have been very helpful (and nice too!). As soon as you mentioned about needing to intensify the tonal value of the trees I could see exactly what was wrong ... and they need much deeper shade to bring out the nature of the bright sunlit morning. Sometime when I work on a painting I just get 'blind" and whilst I know there's a problem with it I just can't "see" it. An outside view is so very helpful. I'm going to rework the area above the bridge ... and will post a pic when done. Hi Jane, I will give my thoughts in hopes that others will do the same for me. One of the reasons I posted on this site was to get some advise from other artist. So here goes. First off the painting is beautiful ! The water reflections are stunning and the bridge with the shadows is so precise. The contrast in lights and darks on the ground are excellent and could be brought up into the tree in the foreground. This will give you more depth. Perhaps lighten the tree on the left behind the bridge. Also maybe lighten the tree area as you look thru the bridge. The blue area on the left of the bridge is a little confusing to me , maybe dull it a little. On that note, I love your artwork and now feel a little apprehensive giving any comments at all. Hi Jane. I'm hardly qualified to offer advice, especially when your standard is so high, however I will offer my humble opinion. With such a strong light source, I think there should be more/darker tones to represent shadow within the foliage of the trees, and perhaps more detail in the closest tree. For the rest of the painting - DON'T TOUCH IT - terrific. Cheers.